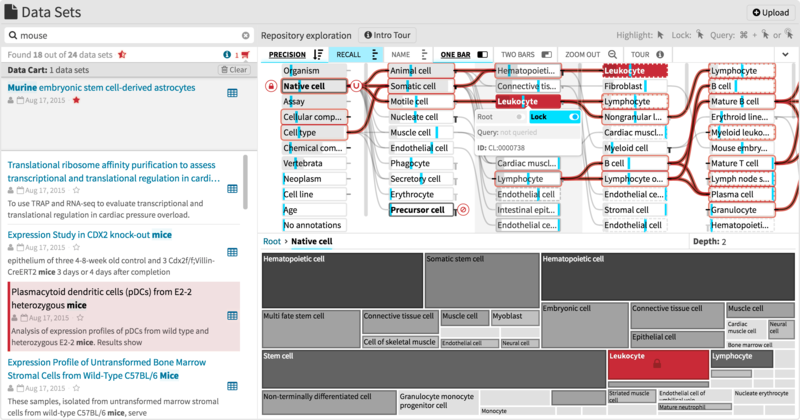 SATORI is an ontology-guided visual exploration system for data repositories, which combines powerful metadata search with a treemap and a node-link diagram that visualize the repository structure, provide context to retrieved data sets, and serve as an interface to drive semantic querying and exploration, and thereby support the information foraging loop. 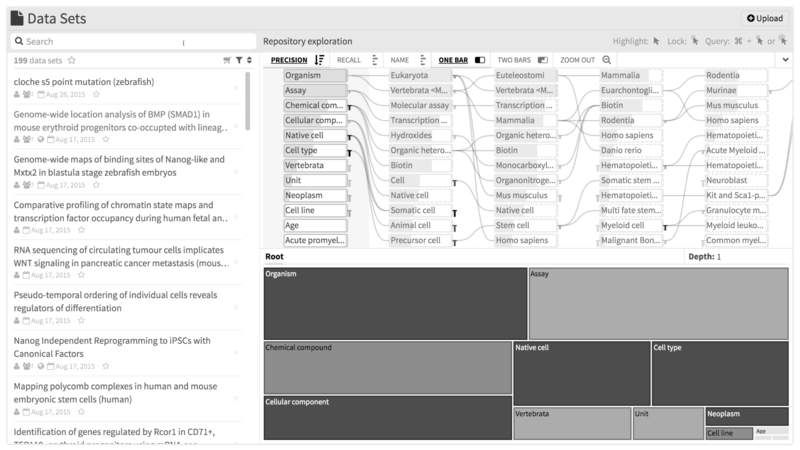 SATORI is web-based, open-source, and integrated in the Refinery Platform – an application for biomedical data management, analysis, and visualization. SATORI is published in Bioinformatics! Version 1.5 released: SATORI now features a central query interface for handling selected ontology terms. Also support for minimizing or maximizing one of the two visualizations is added. The node context menu of the node-link diagram now shows the OntID and URI. Finally, each main components features an interactive introduction to alleviate the learning curve. Fig. 1: Exploration behavior of different user roles. Why? Biomedical repositories are growing rapidly and provide scientists with tremendous opportunities to re-use data. In order to exploit published data sets efficiently, it is crucial to understand the content of repositories and to discover data relevant to a question of interest. These are challenging tasks, as most repositories currently only support finding data sets through text-based search of metadata and in some cases also through metadata-based browsing. To address this, we conducted a task analysis through semi-structured interviews with 8 PhD-level domain experts and identified 3 distinct user roles (Fig. 1). Fig. 2: SATORI's system and data model. What? Biological data sets consists of experimental data and metadata describing the studies, properties of the analyzed biological samples, and attributes of individual data files. In this context, a data set is a collection of data files, along with the metadata (Fig. 2). Additionally, metadata is partially annotated with ontology terms. An ontology describes a certain domain (e.g. human anatomy), defines controlled vocabularies for its concepts and relationships (e.g., kidney and is-part-of) and relates concepts with each other (e.g., nephron is-part-of kidney). By means of ontology terms, sets of annotated data sets can be classified hierarchically. 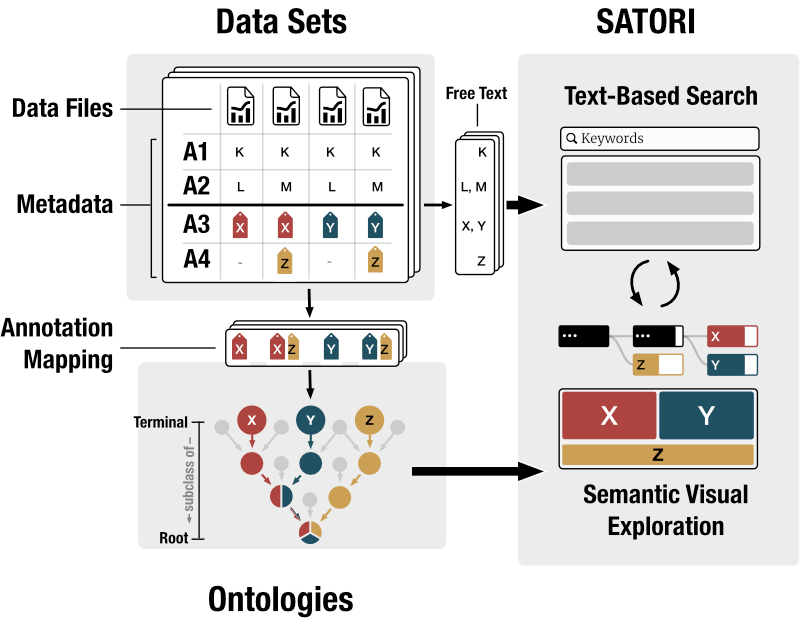 SATORI extracts free-text and ontologically annotated metadata (Fig. 2). The free-text metadata is indexed in a text-based search system. Additionally, data set-related ontology classes are parsed and visualized to provide semantic context to data sets. Since SATORI's goal is to support exploration rather than to visualize ontologies themselves, only a relevant subtree of the ontologies is shown, i.e., effectively enforcing a strict containment hierarchy (Fig. 3). Fig. 4: Precision and recall. How? SATORI is composed of two main interlinked views: the data set view and the exploration view. In the treemap an ontology term is illustrated by a rectangle. The area of the rectangle visualizes the size of the term relative to its sibling terms and the color indicates the distance to the farthest child term. The farther away this child term is, the darker is the color. The node-link diagram represents ontology terms as nodes and links shown parent and child terms (Fig. 5). Additionally, the diagram visualizes the precision and recall (Fig. 4) for each term given the currently retrieved data sets. In this context, precision is useful to understand how frequently a term is used for annotation in the retrieved set of data sets and recall provides a notion of information scent by indicating if there are more data sets annotated with this term. Finally, the exploration view acts as a semantic query interface and lets users filter down collections of data sets via ontology term-based Boolean queries. All parts of SATORI are publicly accessible and open-source. Copyright © 2017 the President and Fellows of Harvard College. All content on this website is licensed under the Creative Commons Attribution license (CC BY). Copyright of the linked papers is with the publishers.